Tool for Recovering Deleted Video Files from Hard Drive, Pen drive, Memory Card, etc. Have you deleted important videos accidentally from computer, laptop or memory card? If you have encountered this situation, then video recovery software can help you to bring back deleted videos. It is advanced recovery software designed especially to restore deleted videos. No matter your videos are deleted accidentally or due to system error, you can get them back using video recovery software. 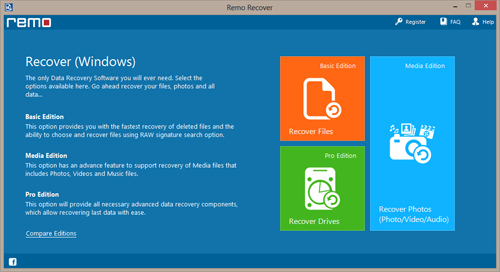 Restoring deleted videos is easier than ever before if you have the reliable and powerful recovery application. The video recovery software has multiple features, which makes possible to get back deleted videos from different storage devices with ease. Your video file or folder may be deleted due to carelessness or system crash, sudden system shutdown, hard disk crash, sudden power failure, etc. 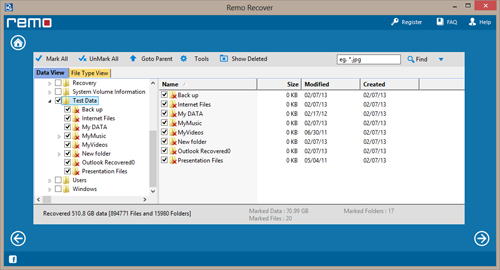 The recovery software is capable to retrieve videos under all such scenarios. This software also provides you a simple way to repair corrupted videos. Using video repair software, you can easily repair Canon camcorders MOV file in few simple steps. Some advanced features of video recovery software are explained below. It is capable enough to retrieve videos that are deleted due to negligence or by accident. It supports deleted videos recovery from various storage media including hard drives, USB flash drives, flash memory cards, etc. This application can rapidly identify the recoverable media files based on the file signatures. It is capable to scan & retrieve videos from different types of hard drives such as IDE, ATA, SCSI. After completion of scanning process this software lists files in file type view and data view. Now you may be wondering why the deleted videos are recoverable. Whenever you save a new file on your hard disk (or any other storage device), the file entry is made in the file system. Once the file is deleted, just file entry is erased from the file system and the video can no longer be accessed. The actual video content is still present on hard disk. This is why the video recovery software is capable to restoring deleted videos even after they are deleted from the storage device. To recover deleted videos successfully, it is also important to avoid using storage device (from which video was deleted). When you come to know about video deletion, stop saving any new file on your storage device so that deleted video files is not overwritten by any new file. Full recovery of video file depends on how soon you execute this video recovery software. Video recovery software is compatible to recover different video file formats, such as AVI, MP4, MOV, 3G2, 3GP, MPG, MPEG, RM, M4V, etc. Video recovery software can be used to restore deleted videos on FAT16, FAT32, NTFS, NTFS5, ExtFAT, HFS+ and HFSX partitions or drives. One can also use it for recovering deleted photos, music and other data. You can evaluate recovery results by using demo version of this software. As scanning process gets completed you can find specfic file by sorting them on the basis of file name, file size, file type, and creation date. If you want to save recovered video files, then you need to purchase the full version of this software. One of the versions of this software can be used for fixing corrupted MPEG video files. 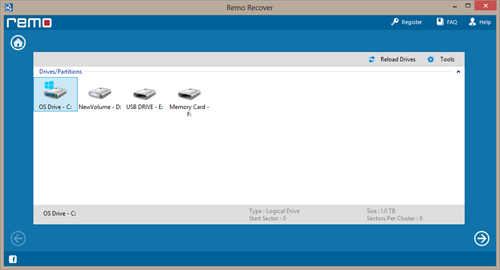 Step 1: Run video recovery software on your computer and select “Recover Photos” option from the main page as shown in Figure 1. By selecting this option, the software lets you recovering deleted video files of different types. Step 2: From the next screen select “Recover Deleted Photos” option and select the drive from which you want to get back deleted videos. After that continue the recovery process by clicking on next arrow button as shown in Figure 2. Step 3: Once the recovery process is completed, you can see the list of recovered video files before restoration, by using “File Type View” option as shown in Figure 3.